50% of our readers demanded the Section 179 Deduction Calculator in Numbers as most of them are Mac user. Thus, we decided to make our first-ever template in Numbers. It was really enjoyable to work with Numbers. 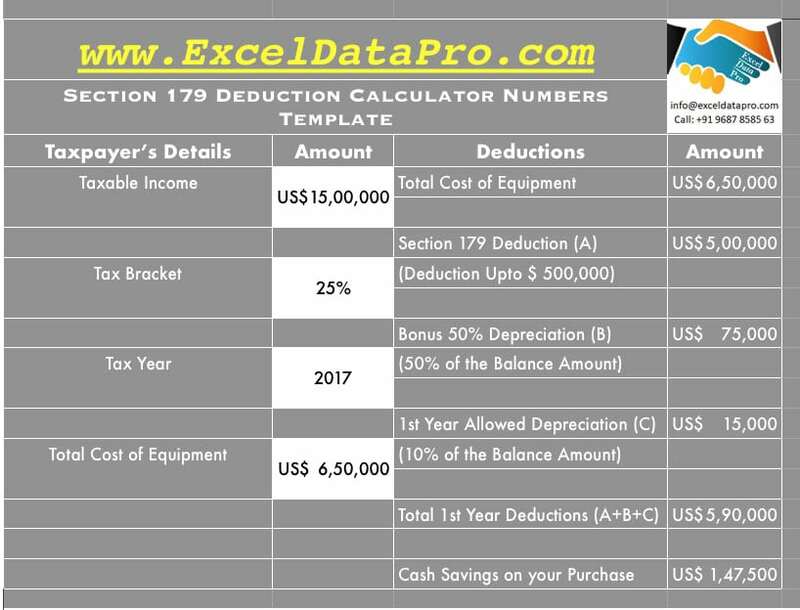 Section 179 Deduction Calculator in Numbers is a template which calculates the money amount saved by you while opting for Section 179 Deduction Calculator. The limit in the year 2017 is $ 5 00,000 with the threshold limit of total equipment to be $ 2 mn. The limits for the year 2018 has been increased to $ 10,00,000 (1 mn) from $ 500,000. Note: To claim the Section 179 Deduction, the equipment should be purchased and put into service by midnight 12/31/2017. Section 179 Deduction is an immediate expense deduction allowed to small businesses to claim the purchase price of their business equipment up to $ 500,000 under certain conditions to be met. The property should be in taxpayer’s name or must have the legal rights over it. It should be tangible, depreciable and personal property. Purchased and put to use in the same year. Acquired from a non-related party. Different type of property has a different ruling like a motor vehicle, manufacturing equipment etc. Publication 946 for more about depreciation and Section 179 deduction. 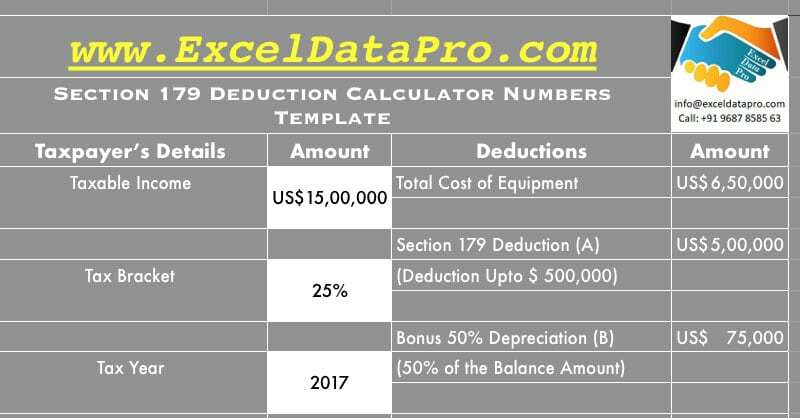 We have created a simple and ready to use Numbers Template for Section 179 Deduction Calculator with predefined formulas. You just need to insert your basic details and it will automatically calculate the amount for you. Click here to download Section 179 Deduction Calculator In Numbers. Let us discuss the contents of the template in detail. Taxable Income: It is mandatory to enter the taxable income in the template because if your taxable income is less than the claimed amount of Section 179 deduction you don’t qualify for the deduction. According to Section 179 (b) (3), the deduction amount shall not exceed the aggregate amount of taxable income of the taxpayer. Tax Bracket: Enter your tax bracket in which you fall for the tax year. Tax Year: Year for which the Section 179 deduction is claimed. 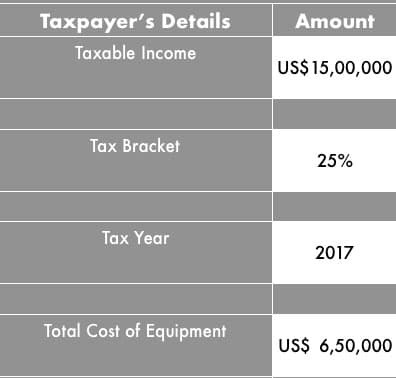 Cost of Equipment: Total cost of equipment purchased and put to use in the tax year. Section 179 Deduction: Section 179 Deduction for any equipment up to $ 500,000 is permitted by law. If your equipment is above $ 500,000 you get only $ 500,000. If below you can write off the complete equipment in the first year itself. 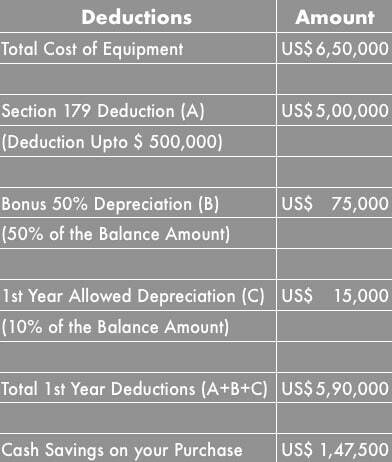 50% Bonus Depreciation: In case the equipment is above the $ 500,000 threshold, then you are entitled to a 50% bonus depreciation. For example, the cost of your equipment is $ 650,000. You are entitled to write off the $ 500,000 as section 179 deduction and also be able to claim the 50% bonus depreciation on the balance amount; that is $ 75000 (150,000 x 50%). 1st Year Depreciation: First-year depreciation is taken as 10% of the balance amount. Similar to bonus depreciation, this depreciation is claimable on if the value of the deduction is above $ 500,000. Total First Year Deduction: This cell will give you the total amount of deduction you will get in the first year of the purchase of the equipment. In addition to the above, the cost you will save will also consist of the amount of tax you will save along with the deductions.